Jeff and I have been making two-dimensional art for a long time. I've been making paintings and drawings since childhood and was educated as an artist. Jeff has been thinking what mathematicians think and writing it down since childhood and was educated as a mathematician and as an artist. In the 1960's Jeff became involved with computers and their programming and with using the computer to help people solve their problems. When the University of Kansas was given a plotter in 1967, Jeff was asked to test it. We began to think of drawing lines with it in ways that we found visually interesting. Together, we had enough common background and experience to begin to use the computer graphically. 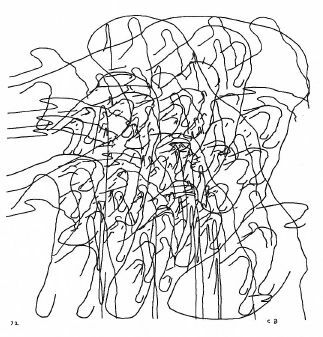 Together we draw with the computer and sign the drawings CB—Colette-Charles Bangert. 'Blue Circled Through Black' (continuous line study) 23 x 23 inches. 1972. Computer; colored inks on paper. 'Large Landscape: Ochre and Black' 33x23 inches. 1970. Computer; inks on paper. The subject of all my work has been landscape. The elements of both the computer work and my hand work are often repetitive, like leaves, trees, grass and other natural landscape elements are. There is sameness and similarity, yet everything is changing. Landscape yields both texture and form. The pictorial form is usually all-over, with non-focus details which form patterns, since I feel these as essential properties of landscape. A field has no center, and is not really flat, so I use no flat areas. The form of grass as grass, leaves as leaves, is what I'm exploring. Landscape form is itself the subject. Line as form. Grass as form. Grass is also random and random is a natural computer facility. Computer grass is natural grass. 'Contained Contours I' 8 × 8 inches. 197. Computer; ink on paper. I always seem to be in the process of learning about line and land forms. I learn from what I see and what I draw. What my hand-eye draws is different from what the computer draws. A computer helps by offering new visual ideas. These ideas in turn enrich new hand work which generates additional ideas which extends my thinking about computer generated lines. The learning circle closes on itself. The computer and Jeff force me to verbalization and conception of what the making of a graphic drawing really is about. And I in turn force Jeff to think about the programming of serious aesthetic drawing problems. Together we try to define what makes up a drawing we would like to see. 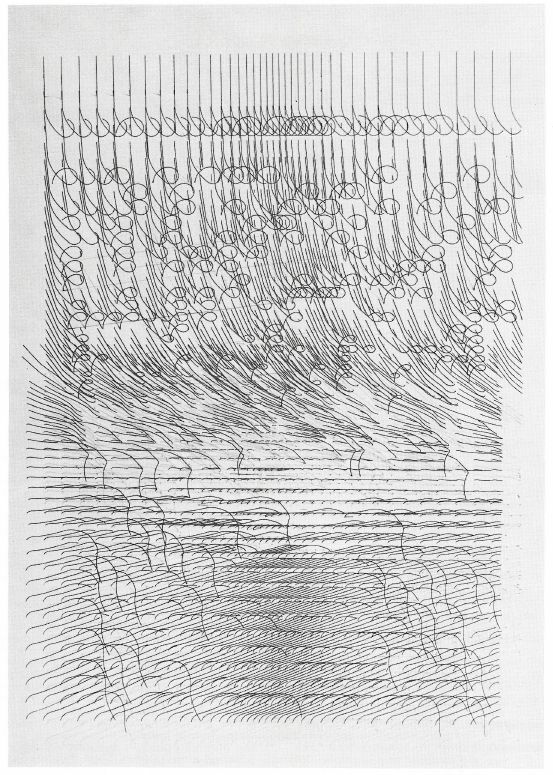 Without conscious understanding of what a drawing is we could not use the computer as a drawing medium. A line carves out form on a white sheet of paper, a line carves out implied visual space. A line is an abstract element which I have seen and explored. A line is grass or the edge of a leaf, a shape, a symbol. The line does not exist, it can be drawn. Jeff and I use the computer as a traditional drawing medium. The resulting drawings are to be seen, to hang on a wall, to communicate. They are not just examples of computer technology, not just geometry, not just mathematics. We ask this new medium questions and get new (and old) answers. But some of the answers were there from the beginning...landscape. 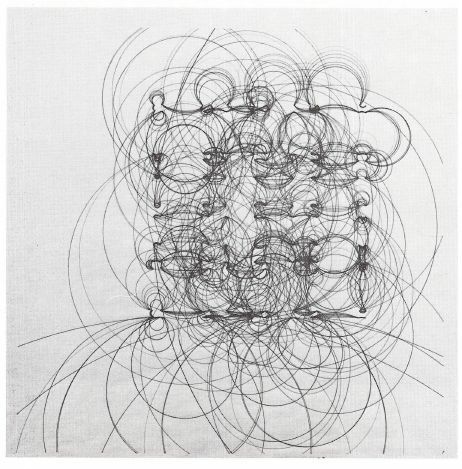 That it is possible to use mathematical formalism and pure geometry while attempting a humanistic exploration to us is one of the primary advantages of the use of the computer as a drawing medium. Now I am beginning to see what a line is about. To see that I can choose to draw little lines, a one big sweep of the arm line, a coiled or an uncoiled line, crossing lines, spiraled lines, decorative lines, random lines, and it's all the same line. Where and how these lines are placed and colored make the drawing what it is, that composition is perhaps the truly difficult element in the making of a drawing. Now I have really to think about what I am doing while drawing in order for Jeff to write a program to deal with what I can do as second nature. This thinking has made the making of the hand work much clearer. We consider each drawing element as an independent element. This is artificial. Yet, this artificiality is precisely one aspect of the use of a mathematical attitude—the separation and isolation of individual elements of a problem. Our computer graphic efforts have shown us just how complex even the most simple meaningful hand made drawing is. In addition to making drawings using the computer, we appear to be finding out just what the making of a drawing is about regardless of its medium. To me, the impact of the computer on the art of drawing will be profound. If I and Jeff and a computer can formulate visual ideas which communicate more clearly to ourselves and to others than just I alone can by hand, certainly the computer's effect on other artists will be even more profound. A new kind of renaissance is beginning. All those now working visually with the computer are Giottos announcing the coming of a new visual age. Just as the technical development of the camera changed people's visual experiences and changed art during the last hundred years, the computer will affect the visual dimensions of people's lives. The pre-camera, pre-computer Chinese artist took a life-time of understanding in order to make one meaningful ink filled brushstroke. It may take a life-time to develop a computer program to make one new communicating pen line which is meaningful for us.